The Bite Me! Prosthetic includes one latex theatrical quality bite wound prosthetic by Woochie as pictured. This item is designed by Woochie's makeup artists to fit as no thick edged, scissor trimmed product can. Woochie Prosthetics feature paper thin edges for the smoothest blend onto the skin, or have Woochie's exclusive invisible net base for secure, gravity defying illusions. They are the best shaped, lightest, most flexible and most comfortable prostheses on the market today. They are individually hand crafted using exclusive techniques and materials. These prosthetics are packaged to preserve their shape and come with complete instructions for application and care. You've probably seen them on some of the most famous faces in Hollywood! 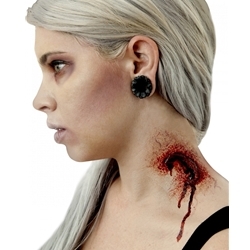 Apply with our Prosthetic Makeup Application Kit and pair with Stage Blood to complete your injured look this Halloween!